Whether you’re here because you love coffee and want another way to wake yourself up in the mornings or because you need a good gift for the holidays this year, there’s no doubt you’ll enjoy this is quick, simple, and affordable DIY! The particular brand of soap base I have linked for you is packaged into two 1lb blocks. 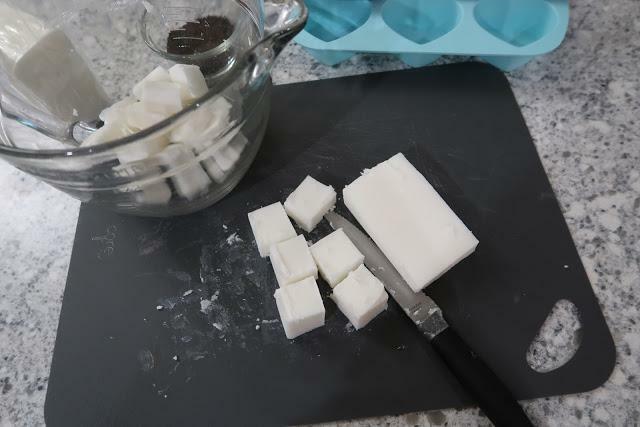 I recommend taking one block and slicing it like into 6 thick slices and then cubing each slice into a bowl (cubing is best with any soap base though). 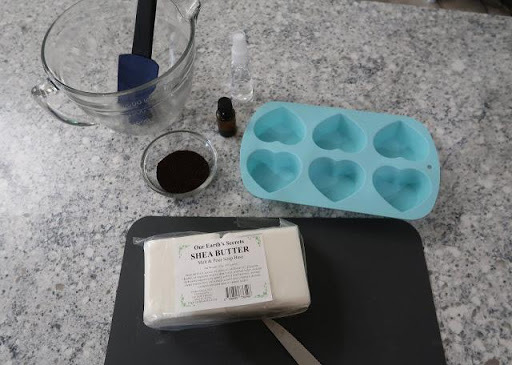 Then, put it into the microwave for 25-35 second intervals (depending on your microwave wattage) mixing in between to make sure that all the cubes have melted. As always, take caution when taking it out of the microwave as the bowl and the soap base may be extremely hot! 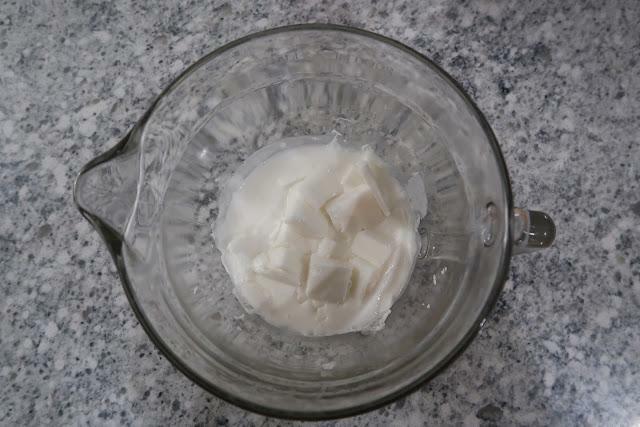 Keep in mind also that the next few steps need to be done quickly as to not let the soap base cool or it will harden. 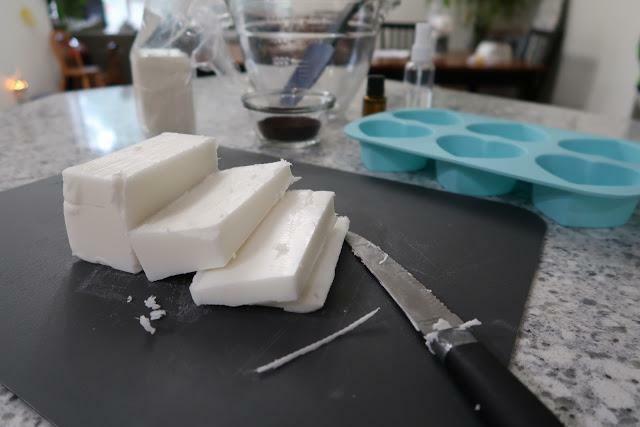 What’s great about making this type of soap is that it can be quickly popped into the microwave for another few intervals and you can liquify it again! 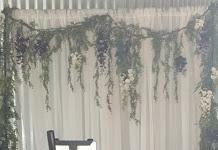 So any kind of vanilla fragrance oil would work for this though I did want to mention that I personally do not recommend using vanilla extract due to the alcohol in it. Feel free to mix in as little or as much fragrance as you’d like, but with the fragrance oil competing with the strong smell of coffee I recommend starting at 15 drops and adding more from there if still needed. 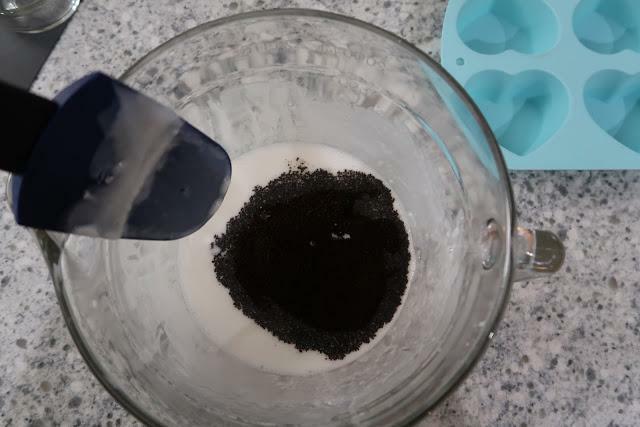 After mixing in the fragrance I microwave the soap base one last time for about 15 seconds just to make sure it’s not going to start hardening while I mix the coffee grounds. The type of coffee grounds you decide to use is completely up to you. You could even use the grounds from this morning’s coffee if you haven’t tossed it out yet! 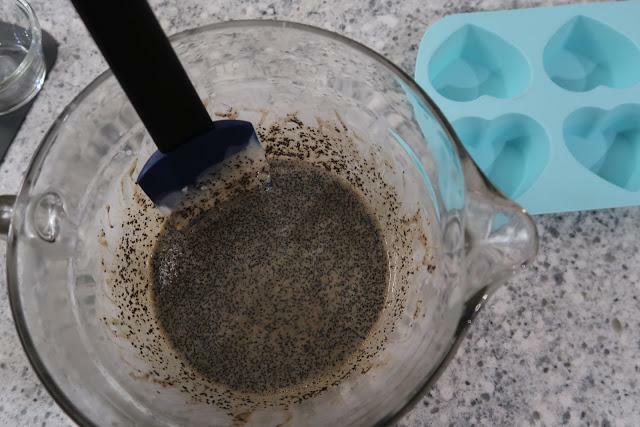 Just remember to mix well, and work quickly as it starts to get easier for the soap base to harden once you add the coffee grounds. 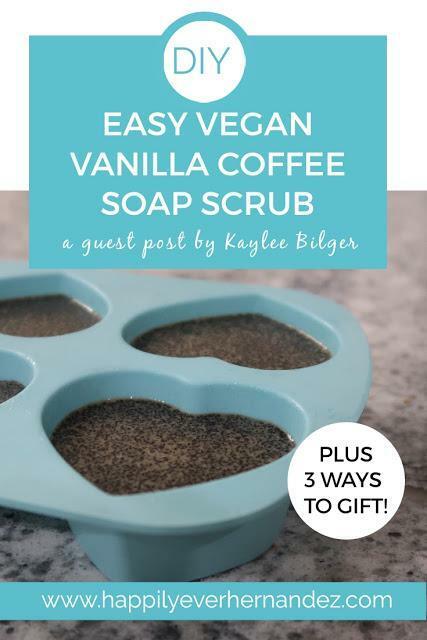 Typically regular ground coffee is exfoliating enough for most people, but if you’d like to add some more texture feel free to blend some coffee beans on your own and mix some bigger bits of coffee into the soap! You can find several different types of silicone molds online and in stores nowadays, just pick your favorite! However, I cannot stress the importance of silicone in this case because it will make the world of a difference when it comes to taking your soaps out. 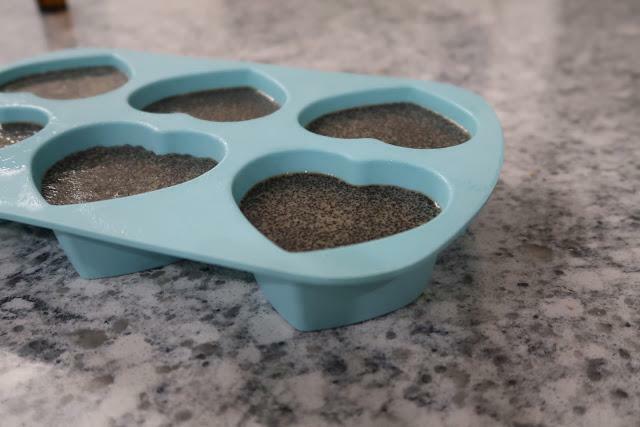 Pro Tip: Put your silicone mold on a baking tray not only to avoid messes all over your counters or tables but also to allow you to be able to move the silicone mold while the soap hardens. Moving the mold without a tray while the soap is still not done can cause imperfections and messes! When pouring your soap try to keep the amount of soap base in each cavity equal making sure that you leave some space at the top. Keep your toothpick and the bottle of rubbing alcohol spray handy as well to help get rid of any bubbles that might come up on top! I like to use the toothpick to help bring the bubbles to one area, and then spray rubbing alcohol on them to pop them. This helps to leave a clean, seamless, and perfectly smooth surface when the soap hardens. Depending on the size of your molds it can take anywhere between one to three hours for the soap to completely harden. 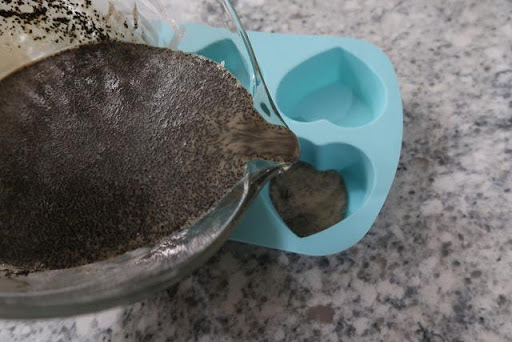 After they’re done, carefully just push up from the bottom of one of the cavities to pop out a bar of your now deliciously smelling coffee soap scrub! Now that the soap is made you can decide if and how you’d like to gift it! Shrink wrapping soap is one of the best ways to help preserve not only the cleanliness but also the fragrance! If you plan on storing your soap for later use this is ultimately what I would recommend. Simply take a shrinkwrap bag, place the bar of soap in it, and seal it with the shrink wrap sealer as closely to the edge of the bar as possible to eliminate extra on the side. Then take a hair dryer to tighten the seal. You can also add stickers or labels to it for easy reference or gifting! 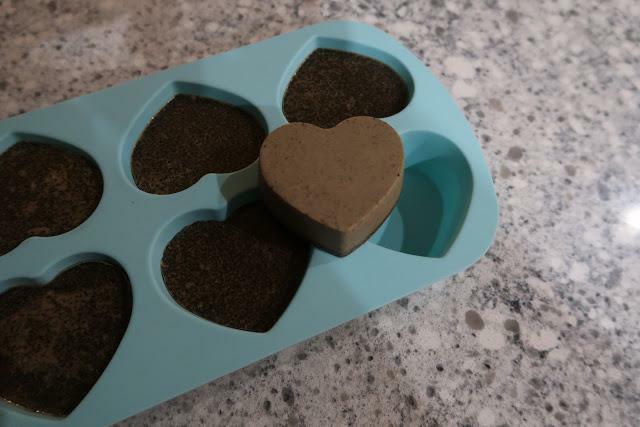 Depending on the size of your bars you can have a few coffee soap bars in a goodie bag with some shredded crinkle paper, or you can add some coffee beans as your goodie bag filler and place a bar of soap on top. 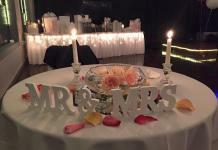 Then, simply tie a ribbon around it and voila! 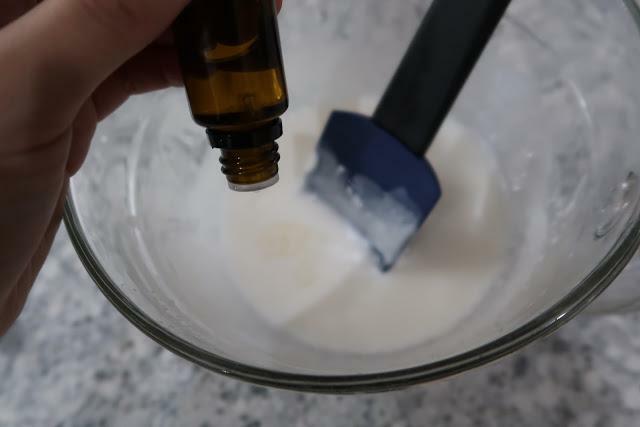 Just keep in mind that due to the nature of the soap, over time, crinkle paper might start to soak up some of the oils in the soap, potentially causing the crinkle paper to flatten. 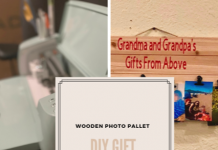 So I personally love the look of a handmade, almost rustic look for gifts! I think this is perfect especially for the holidays. However, I don’t recommend this one if you’re going to be giving the soap a long while after you wrap it. Simply because over time the wrapping paper may start to soak up some of the oils from the soap. All you need to do is wrap with postal wrapping paper or even a brown paper bag would work (cut to fit), and tie a bow around it with some twine! 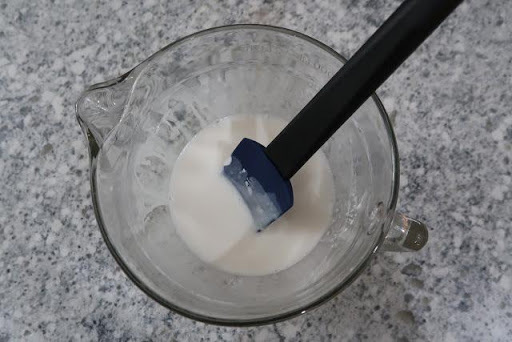 Want to know the best part about this particular soap recipe? It’s completely customizable! You can substitute the fragrance for any other blend, or you can choose essential oils for natural aromatherapy (if you don’t use coffee, bring the number of drops of fragrance/essential oil to about 6-8 per pound). Substitute the coffee for sugar and make a nice sugar scrub, or oatmeal if you have sensitive skin. There are so many different combinations you can make! Leave a comment, and let us know if you decided to try it out! 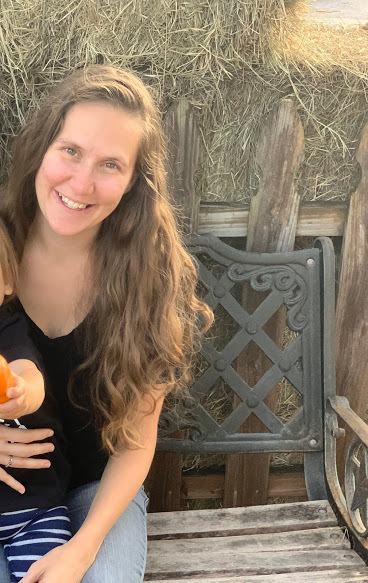 Make sure you check out the guest post Sara wrote for my blog where she shares the best baby and toddler gift ideas. 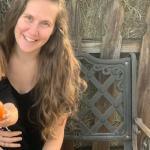 *This post contains affiliate links, for further detail please see my disclosure here. 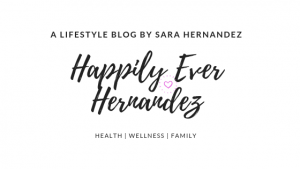 If you enjoyed making this, check out Happily Ever Hernandez’s other DIYs like Wedding Flowers on a Budget or create your own Wedding Photo Booth! I love scrubs but have only made them with sugar. This is a great idea to make them with coffee grounds. I bet they smell awesome, too. These would make a fun gift for a coffee lover. 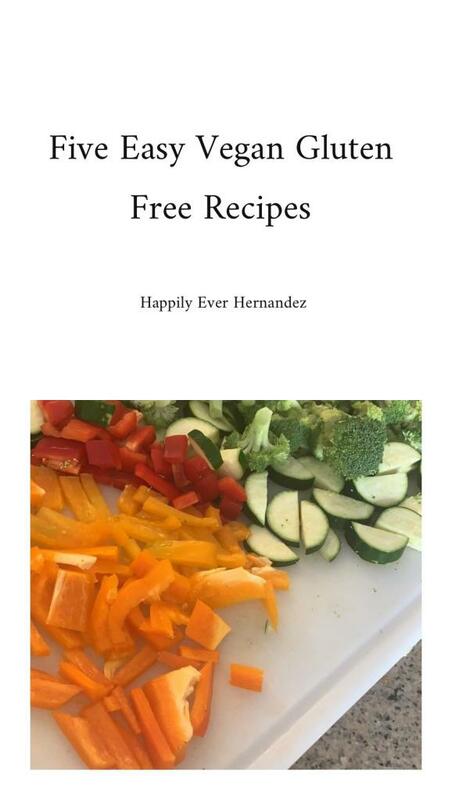 I just saved this on Pinterest so I don’t lose this recipe. Thanks for saving it! Let me know if you make it and like it. I made something similar for my husband once, and it smelt so good. I love the smell of coffee even though I don’t enjoy the taste very much.